Maurice Jones served as Charlottesville's official city manager from December 6, 2010 to July 31, 2018. The 2010-2011 City Council appointed Jones as the Charlottesville City Manager on December 6, 2010. On May 25, 2018, The 2017-2018 City Council opted not to renew his contract when it was set to end in December 2018. Jones was soon hired as Town Manager for Chapel Hill, North Carolina. He had previously been serving as the acting city manager since April 12, 2010 following the resignation of Gary O'Connell. Maurice Jones was appointed as Acting City Manager, effective April 13, 2010, by a Resolution of the City Council approved on February 16, 2010. The Acting City Manager is authorized to take all actions and to assume all duties and responsibilities normally required of the City Manager for the City of Charlottesville. Jones was one of three finalists in a bid to become the permanent city manager later that year. His selection was a unanimous choice by City Council. As part of his contract, Jones initially made $170,000 a year. He was also eligible for a no-interest loan of a down payment for a home within Charlottesville city limits. Jones was born at the Dewitt Army Hospital at Fort Belvoir in Fairfax, Virginia. He grew up in Dale City, Va.
Jones graduated from James Madison University in 1992 with a bachelor's degree in communications. He moved to Charlottesville in 1993 when he was hired as a sportscaster for NBC29. Jones was first hired by the City of Charlottesville in 1999 to serve as Director of Communications. In 2005, he stepped down to take a position at the Miller Center of Public Affairs. He returned to the city in February 2008 to become Assistant City Manager. From February of 2008 to April of 2010 Jones served as Assistant City Manager. Charged with leading the City’s community relations efforts, Jones served as the primary staff contact on the City’s Dialogue on Race initiative; worked with then Police Chief Timothy Longo, to establish the Citizens Advisory Panel; managed the City’s Quality of Service and Efficiency Study; and worked with neighborhood associations and residents on variety of community issues. 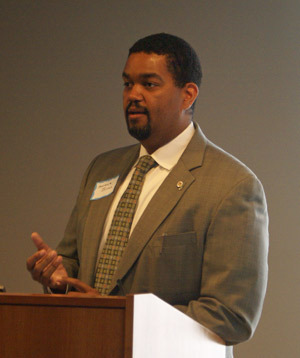 The 2010-2011 City Council appointed Jones as the Charlottesville City Manager on December 6, 2010. ↑ Web. More Mo: Jones in as city manager, Lisa Provence, The Hook, Better Publications LLC, December 3, 2018, retrieved May 25, 2018. Print. December 9, 2018 . ↑ Web. Murphy named interim city manager, Bryan McKenzie, News Article, Daily Progress, July 31, 2018, retrieved August 1, 2018. ↑ Web. Charlottesville will not renew City Manager Maurice Jones' contract, Staff reports, Daily Progress, World Media Enterprises, May 25, 2018, retrieved May 25, 2018. ↑ Web. New C'Ville City Manager Picked, NBC 29, retrieved November 23, 2010. ↑ Web. Housing issues prominent in city manager's 'stretch' goals, Aaron Richardson, Daily Progress, World Media Enterprises, September 2, 2013, retrieved September 3, 2013. ↑ Web. Council gives manager another 9 months to move into city, Graham Moomaw, Daily Progress, World Media Enterprises, retrieved December 20, 2011. ↑ 10.0 10.1 10.2 10.3 Web. Meet Your Government: Maurice Jones, Kurt Walters, Charlottesville Tomorrow, December 21, 2011, retrieved December 22, 2011. ↑ Web. Jones making move to the city, just in time, Graham Moomaw, Daily Progress, World Media Enterprises, September 1, 2012, retrieved September 10, 2012. ↑ Web. Maurice Jones named new assistant city manager, C-Ville Weekly Writers, C-VILLE Weekly, Portico Publications, January 23, 2011, retrieved December 22, 2011. Print. January 22, 2011 , 20.04, . May 7, 2010 episode of WINA's Charlottesville--Right Now! Dec. 3 2010 episode of WINA's Charlottesville--Right Now! This page was last edited on 21 April 2019, at 21:27.